Watermelons have become the major dry season cash crop for progressive small-holder rice farmers in Savannakhet province, Lao PDR. The watermelons are grown in cylindrical pits in rice paddies watered by hose from small farm dams. Lester Burgess’s earlier work confirmed Fusarium wilt was the main cause of serious losses in many farms. Therefore, the focus of the visit underway is an extensive survey of Fusarium wilt of watermelon across five districts in SVK. Nina and I have been assisting in any way we can and participating in the field surveys, some lab work and reading of relevant literature to support what we are seeing. Nina has been recording and collating valuable data on the watermelon farming systems we visit, which Lester reminds us is highly valuable, as disease severity and the ability of the farmers to cope and respond is dependent on a complex web of social and agronomic factors. I have been working on mapping the extent of watermelon diseases we observe and researching the soil quality with the help of other academics. We have both been working with Kaisone and Dui, two local volunteers. They are not only our main translators, making the surveys possible, but also our main source of mischievous fun during our time here (convincing me to eat a green chilli on the first day at lunch). It has been fascinating to participate in on-the-ground lab work. Often there is a lack of modern lab equipment. Victor Puno, a visiting PhD student studying Fusarium wilt in watermelons, has been highly resourceful and inventive, using a thorough understanding of procedures to adapt the new lab. Even simple tasks such as sterilising equipment must be planned well in advance and is usually limited to kitchen pressure cookers and baking ovens. 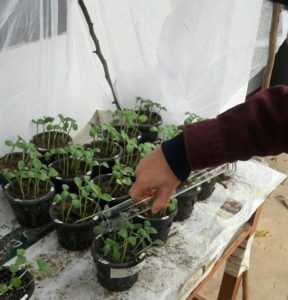 The photo (above) shows Nina inoculating watermelon seedlings with Fusarium isolates from around the SVK region. We are now waiting rather sadistically for their quick death to prove pathogenicity. For previous articles and blogs on volunteers and researchers currently working with mentor Prof. Lester Burgess in Laos PDR, click on the links below.